PYEONGCHANG, South Korea – Mason Raymond likes to be forward thinking in his day-to-day approach to life rather than stare into rear-view mirror reflecting on what could have been. Take the road he travelled to the PyeongChang 2018 for example. Raymond is a 546-game NHL veteran and he divided most of his career among three Canadian teams – the Vancouver Canucks, Calgary Flames and the Toronto Maple Leafs. His last NHL team was the Anaheim Ducks, having signed with them in July of 2016, but he did not resurrect his career in Southern California. After four games into the 2016-17 season, he was reassigned to the minor leagues but Mason decided to stay away from hockey to be with his wife, Megan, who had been diagnosed with Lyme Disease. Outside of playing for Canada at the 2017 Spengler Cup, Raymond did not play last season, but that competitive drive that fuels all professional athletes was still there. 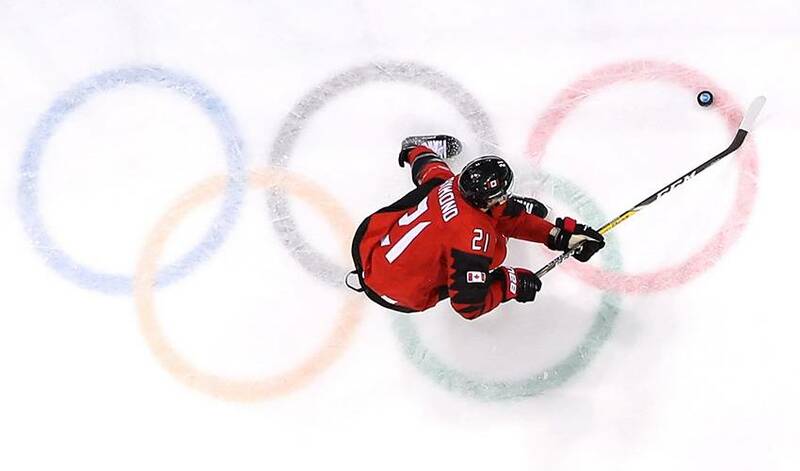 When word started to spread in the tight-knit hockey world that the NHL was considering doing the unthinkable – not commit to the 2018 Olympic Games – Raymond started thinking seriously about fulfilling a lifelong dream. Raymond saw an opening to do what he has always wanted to do, and that was represent Canada at a Winter Olympics. With that in mind, he signed with SC Bern of the Swiss League in July of 2017, and packed his bags for Europe. Raymond recalled the first time some of the players in the mix for Team Canada training camp got together for a tournament last August in Sochi, Russia. Prior to the start of the Olympic Games, Team Canada coach Willie Desjardins talked about how Canada would have to score by committee, and Raymond is one of the players he is counting on. One thing about Raymond’s game is he has speed to burn and soft hands. “We need guys like him to step up,” said Desjardins. The absence of the world’s top players on the sports world’s biggest stage has created a playing field in hockey much more level than it has been in decades. Witness Slovenia’s 3-2 overtime triumph over Team USA. Raymond wants nothing more than to have an Olympic gold medal slipped around this neck. But if it doesn’t happen, Raymond is not going to pout as he is living his Olympic dream. “You can draw it up a million different ways and I think things happen for a reason. It’s like the old cliché, when one door closes the other opens. You follow your path and whatever direction it goes, who knows?’’ he said. His path led from making his family a priority when his wife fell ill to moving to Europe to chase a dream. And if he wins the ultimate prize, the first person Raymond will share it with is his wife, his lifelong partner who has stood at his side throughout his journey to PyeongChang.